The ducat /ˈdʌkət/ was a gold or silver coin used as a trade coin in Europe from the later Middle Ages until as late as the 20th century. Many types of ducats had various metallic content and purchasing power throughout the period. The gold ducat of Venice gained wide international acceptance, like the medieval Byzantine hyperpyron and the Florentine florin, or the modern British Pound sterling and the United States dollar. +IC XC RC IN ÆTRN, nimbate bust of Christ facing, holding Gospels R•R SLS, King Roger and, R•DX•AP, Duke Roger (son of Roger) standing facing, holding long cross between them; AN R X along staff of cross. The word ducat is from Medieval Latin ducalis = "relating to a duke (or dukedom)", and initially meant "duke's coin" or a "duchy's coin". The first issue of scyphate billon coins modelled on Byzantine trachea was made by King Roger II of Sicily as part of the Assizes of Ariano (1140). It was to be a valid issue for the whole kingdom. The first issue bears the figure of Christ and the Latin inscription Sit tibi, Christe, datus, quem tu regis iste ducatus (meaning "O Christ, let this duchy, which you rule, be dedicated to you") on the obverse. On the reverse, Roger II is depicted in the style of a Byzantine emperor and his eldest son, Duke Roger III of Apulia, is depicted in battle dress. The coin took its common name from the Duchy of Apulia, which the younger Roger had been given by his father. Doge Enrico Dandolo of Venice introduced a silver ducat which was related to the ducats of Roger II. Later gold ducats of Venice, however, became so important that the name ducat was associated exclusively with them and the silver coins came to be called grossi. In the 13th century, the Venetians imported goods from the East and sold them at a profit north of the Alps. They paid for these goods with Byzantine gold coins but when the Byzantine emperor Michael VIII Palaiologos backed a rebellion called the Sicilian Vespers in 1282, he debased the hyperpyron. This was just one more in a series of debasements of the hyperpyron and the Great Council of Venice responded with its own coin of pure gold in 1284. Florence and Genoa had introduced gold coins in 1252 and the florin of Florence had become the standard European gold coin. Venice modeled the size and weight of their ducat on the florin, with a slight increase in weight due to differences in the two cities′ weight systems. The Venetian ducat contained 3.545 grams of 99.47% fine gold, the highest purity medieval metallurgy could produce. Gold ducat types derive from silver ducat types, which were ultimately Byzantine. The obverse shows the Doge of Venice kneeling before St. Mark, the patron saint of Venice. Saint Mark holds the gospel, which is his usual attribute, and presents a gonfalone to the doge. The legend on the left identifies the saint as S M VENET, i.e. Saint Mark of Venice, and the legend on the right identifies the doge, with his title DVX in the field. On the reverse, Christ stands among a field of stars in an oval frame. The reverse legend is the same as on Roger II’s ducats. Succeeding doges of Venice continued striking ducats, changing only their name on the obverse. During the 15th century, the value of the ducat in terms of silver money was stable at 124 Venetian soldi, i.e. schillings. The term ducat became identified with this amount of silver money as well as the gold coin. Conflict between England and Spain in 1567, however, increased the price of gold and upset this equivalence. At this point, the coin was called the ducato de zecca, i.e. ducat of the mint, which was shortened to zecchino and corrupted to sequin. Leonardo Loredan extended the coinage with a half ducat and subsequent doges added a quarter, and various multiples up to 105 ducats. All of these coins continued to use the designs and weight standards of the original 1284 ducat. Even after dates became a common feature of western coinage, Venice struck ducats without them until Napoleon ended the Venetian Republic in 1797. When the Roman Senate introduced gold coinage either the florin or the ducat could have provided an advantageous model to imitate[when? ], but the Florentines who controlled the Senate’s finances ensured that their city’s coin was not copied. Instead, the Roman coin showed a senator kneeling before St. Peter on the obverse and Christ amid stars in oval frame on the reverse in direct imitation of the Venetian ducat. The Popes subsequently changed these designs, but continued to strike ducats of the same weight and size into the 16th century. Most imitations of the Venetian ducat were made in the Levant, where Venice spent more money than it received. The Knights of Saint John struck ducats with grand master Dieudonné de Gozon, 1346-1353, kneeling before Saint John on the obverse and an angel seated on the Sepulcher of Christ on the reverse. Subsequent grand masters, however, found it expedient to copy the Venetian types more exactly, first at Rhodes and then on Malta. Genoese traders went farther. They struck ducats at Chios that could be distinguished from the Venetian originals only by their workmanship. These debased ducats were problematic for Venice, which valued its money's reputation for purity. The rarity of ducats that Genoese traders struck at Mytilene, Phocaea, and Pera suggests that Venetians melted those they encountered. In Western Europe, Venice was an active trader but they sold more than they bought so their coins were less used than the florin. After Henckels assassinated Amadeus Aba in 1311, Charles I of Hungary began a gold coinage exploiting ores of Aba's ancient gold mines. His son, Louis I of Hungary changed the designs by replacing the standing figure of Saint John from the florin with a standing figure of Saint Ladislaus and later changing the lily of Florence to his coat of arms, but he maintained the purity of the gold. In the 15th century, a distinction was made between pure gold florins and debased imitations of the florin by calling the pure coins ducats and the debased coins gulden or goldgulden. The Holy Roman Emperor Charles V recognized this distinction in 1524 when he made ducats of the Venetian standard valid money in the Empire with a value 39% higher than the gulden. His younger brother and eventual successor, Ferdinand I, brought this system to Hungary in 1526, when he inherited its throne. The still-pure gold coins of Hungary were henceforth called ducats. Their purity made the Hungarian ducat acceptable throughout Europe. Even the Lord High Treasurer of Scotland left records of the ones his king used for gambling. Hungary continued to strike ducats with 3.53133 grams of 98.6% fine gold. Unlike the unchanging designs of the ducats in Venice, the coat of arms on the reverse of the ducats of Hungary was frequently modified to reflect changed circumstances. In 1470, Matthias Corvinus replaced the coat of arms by a Madonna. Hungary struck ducats until 1915, even under Austrian rule. These were used as trade coins and several of the later dates have been restruck. The Dutch Revolt gave its seven northern provinces control of their coinage. The collapse of the government of Francis of Anjou in 1583, however, left them without a constitutional ruler to name on those coins. They fell back on the longstanding regional tradition of imitating well accepted foreign coins. In this case they avoided political complications by copying obsolete coins. The gold coins Ferdinand and Isabella issued to the standards of the ducat were widely copied and called ducats. They also imitated the Hungarian ducat and those coins had more influence on the subsequent coinage of the United Provinces. Since the Netherlands became a dominant international trader, the influence of these ducats was global. At first, ducats of Hungarian type struck in the Netherlands had a standing figure on the obverse with the crown and battle axe that St. Ladislaus carried on the Hungarian prototype, but naming him with a different legend. Like the original, but not contemporary, Hungarian ducats, the reverse had a shield, which now showed the coat of arms of the issuing province. These types evolved into a standing knight holding a sword and seven arrows representing the seven provinces in the union. The legend, CONCORDIA RES PARVÆ CRESCUNT, shortened in a variation of ways, says “by concord small things increase”. It also names —or shows a symbol representing— the province that issued the coin. The reverse had a tablet inscribed and always shortened in the same way: MOneta ORDInum PROVINciarum FOEDERatorum BELGicarum AD LEGem IMPerii, gold money of the federated provinces of Belgium in accordance with the law of the realm. In the Napoleonic period, the Batavian Republic and Louis Bonaparte continued to strike ducats with these designs. These coins were not issued during the annexation of the Netherlands into the French Empire. Since Napoleon’s defeat, the Kingdom of the Netherlands has continued to issue them as trade and bullion coins. The text in the table on the reverse now says MOneta AURea REGni BELGII AD LEGEM IMPERII. During the 15th century, international traders in Western Europe shifted from the florin to the ducat as their preferred currency. As rulers reformed their currencies, they most frequently used the ducat as a model. The Mamluk ashrafi, the Ottoman altun, and the Castilian ducat are examples. Coinage reforms of The Holy Roman Emperor Maximilian initiated coinage of gold ducats in Austria in 1511. Austria continued to strike ducats until 1915, and has continued to restrike the last of them, including some four ducat coins illustrated here. Nevertheless, bullion for Spain's American colonies allowed the Spanish dollar to supersede the ducat as the dominant currency of world trade. Around 1913, the gold ducat was worth the equivalent of "nine shillings and four pence sterling, or somewhat more than two dollars. The silver ducat is of about half this value." Even now some national mints produce batches of ducats made after old patterns as bullion gold and banks sell these coins to private investors or collectors. The 1934 Czechoslovakia 10 Ducat gold coin (on average) contains 34.9000 grams of gold (0.9860 fine) and weighs 1.1063 ounces. This issue is extremely rare as only 68 coins were struck. Sigismund III depicted as King of Poland on a 10 Ducat gold coin (1614). Sigismund III depicted as Grand Duke of Lithuania on a 10 Ducat gold coin (1616). Austria. The Austrian Mint still mints single and four-ducats, both dated 1915. Byzantine Empire. The Byzantines minted their own version of the Venetian silver ducat, called the basilikon. Germany and the Holy Roman Empire; many cities, states and principalities before 1871. Hamburg many Hanseatic cities issued their own ducats. Hungary. The Hungarian mint still mints commemorative coins with 2, 3, 4 and 6-ducats quality. Netherlands still issues golden and silver ducats having the same weight, composite and design when they were first minted in 1586. Russia imitated Dutch ducats due to their popularity. Also issued small quantities of Russian design. Spain, all through its domains, including Flanders, the Kingdom of Napoli and the Americas. Switzerland. Before the Swiss unification, the Swiss also minted ducats, the most well known of which are the Zurich ducats. This article incorporates text from a publication now in the public domain: Chisholm, Hugh, ed. (1911). "Ducat" . Encyclopædia Britannica. 8 (11th ed.). Cambridge University Press. pp. 628–629. ^ M. F. Hendy, "Michael IV and Harold Hardrada", The Numismatic Chronicle, Seventh Series, Vol. 10 (1970), p. 197. ^ Coins In History, John Porteous, pages 84 and 86. ^ a b Coins In History, John Porteous, page 86. ^ Historic Gold Coins of the World, Burton Hobson, page 39. ^ Coins In History, John Porteous, 106. ^ Coins in History, John Porteous, pages 106. ^ Coins in History, John Porteous, illustration 126. ^ Coins in History, John Porteous, pages 132. ^ Coins of Medieval Europe, Philip Grierson, page 213. ^ Coins of Medieval Europe, Philip Grierson, page 212. ^ Coins in History, John Porteous, pages 184. ^ Coins in History, John Porteous, page 187 and illustration 213. ^ Historic Gold Coins of the World, Burton Hobson, page 88 and illustration 104. ^ Historic Gold Coins of the World, Burton Hobson, page 187 and illustration 243. ^ Global Financial System 1750-2000, Larry Allen, page 128. ^ The Coin Atlas, Cribb, Cook and Carradice, page 88. ^ A companion to the Global Renissance, Juotsna G. Singh ed., page 265. ^ Webster, Noah (1913). Webster's Revised Unabridged Dictionary. G. & C. Merriam Co.
^ Cuhaj 2009, p. 309. ^ Cuhaj, George S., ed. (2009a). Standard Catalog of World Gold Coins 1601–Present (6 ed.). Krause. pp. 490–491. ISBN 978-1-4402-0424-1. ^ Cuhaj, George S., ed. (2009). Standard Catalog of World Gold Coins 1601–Present (6 ed.). Krause. p. 314. ISBN 978-1-4402-0424-1. ^ Cuhaj, George S., ed. (2009). Standard Catalog of World Gold Coins 1601–Present (6 ed.). Krause. p. 996. ISBN 978-1-4402-0424-1. Cuhaj, George S., ed. (2009). Standard Catalog of World Gold Coins 1601–Present (6 ed.). Krause. ISBN 978-1-4402-0424-1. 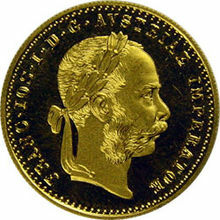 Look up ducat in Wiktionary, the free dictionary. Wikimedia Commons has media related to Ducat.